Patrick Scribner was born and raised in Patchogue and from an early age showed confidence in the open seas. It was only natural that Patrick join the Smith Point Ocean Rescue Team. 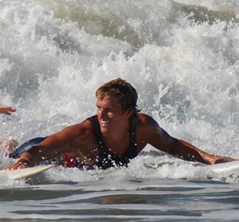 He has been a lifeguard since the summer of 2006 and competing on the local, regional and national levels since 2008. Patrick is one of the most knowledgeable lifeguards on the beach having been around for nine seasons; he has seen it all and is quick to jump into action. Patrick’s hard work, team work, and positive attitude has paid off, thus making him the 2014 lifeguard of the year. Chris Kopiske resides in Saint James, NY. He is currently an educator for Eastern Suffolk BOCES in the high school setting. After school hours, he is a dedicated coach at Smithtown West High School for football, wrestling, and track. Being a lifeguard has brought out the best qualities in him as an individual. On the beach he constantly demonstrates qualities such as constant focus, dedication, perseverance, and selflessness. Being a lifeguard has proved to be extremely rewarding on and off the beach. Chris knows that being a reliable and strong lifeguard include being physically fit and mentally tough; both of which he accomplished with the help of his fellow lifeguards. Chris hopes to be a part of the Smith Point family for many years to come.